Saudi Arabian Businesses Struggle With Rule To Replace Foreign Workers With Locals : Parallels The Saudi kingdom says it is trying to wean the economy off an oil and foreign worker dependency. Employers say it has not been easy. 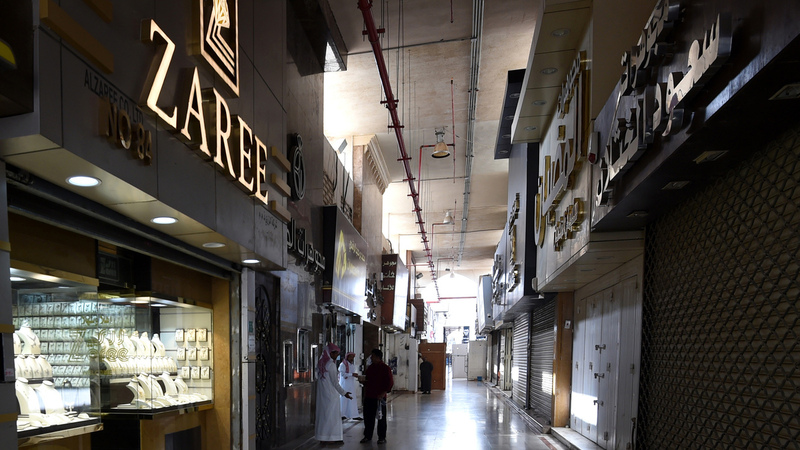 Jewelry shops in Riyadh could be among the businesses to feel the strain after a government edict to replace foreign workers with Saudi ones. The Mobile Market Center is a popular place in Riyadh for anyone who needs computer accessories or help with a cellphone. The two-story mall, next to a busy thoroughfare in the Saudi capital city, has shops selling all kinds of electronics. It's also where the frustrations and challenges of Saudi Arabia's economic overhaul are being played out. The owner of one small cellphone accessory shop on the ground floor sits at a desk, enjoying a cup of cardamom-laced Saudi coffee and some dates. The owner, who goes by the name Abu Saud, has three shops in this mall. He says he was a happy man, and business was good, until the Saudi government told him to replace his foreign workers. For years he hired mostly South Asians who are skilled at fixing cellphones. But under new economic reforms, telecommunications shops are required to hire only Saudi workers. The changes are part of a sweeping plan to wean the kingdom off its dependency on oil revenues and put hundreds of thousands of unemployed Saudis to work in the private sector. But while some economists welcome the reforms, business owners interviewed by NPR during a recent visit to Saudi Arabia say the changes are challenging to implement. For one, Abu Saud says the new Saudi hires don't last long in his shops. "I give them very high salary ... but the problem is they don't like [the work]," he says. He gets the impression Saudis would rather be working in a government office. "Each one he like to have a table, he's a boss. Even if just to graduate he just want to be a boss, direct," he says. Abu Saud has to bring in his two sons — both are doctors — to help run his shops. If he wants to use a foreign worker, he has to pay a fee to the government — anywhere from $80 to $107 per month for each foreign employee. Those fees are due to increase over the next two years as part of the reforms. Soon many other types of retail outlets will also be required to only hire Saudi workers. It's causing a lot of problems for businesses, says a Saudi accountant. NPR is not using his name so he can speak without fear of recrimination. "During last year we have seen a lot of small and medium entities going out of business because they cannot afford it," the accountant says. He agrees Saudi Arabia needs to reform its economy but says the changes should be made more slowly and carefully. "In my office every day I get new regulations either from the Ministry of Commerce or the minister of finance or the tax department. Everyone is changing their own regulations and the bylaws," he says. The uncertainty over regulations and bylaws is affecting the foreign investment the government is trying to attract. "Think about the foreign investor who is staying outside and risking his investment, or taking the risk to invest in a new country," says the accountant, who deals with international clients. Saudi Arabia finished 2017 with 12.8 percent unemployment, according to the official statistics office. Many of its job seekers are young adults, who make up the majority of the country's population. During his reign until his death in 2015, Saudi King Abdullah recognized the potential for economic problems and introduced some reforms. But in 2016, the now Crown Prince Mohammed bin Salman launched Vision 2030, a comprehensive plan to diversify the economy and create more private sector jobs for Saudis. "This is very welcoming because the old Saudi Arabia to be honest ... the system was not viable ... the country was going to collapse," says John Sfakianakis, director of economic research at the Gulf Research Center, in Riyadh. Sfakianakis says Crown Prince Mohammed is making bold changes in the kingdom. "Today you have a very young crown prince who is ambitious who needs to push the envelope ... because demand is changing for oil, technology is changing," he says. Saudi Arabia needs to be part of that change, he adds, as the country has little time to waste. The country is the world's biggest oil exporter, but a slump in oil prices since 2014 and a rapidly growing population have stretched the kingdom's budget. Nadir Mohammed, a World Bank official for the Middle East and North Africa, urges patience as Saudi Arabia's government tries to reduce its dependency on crude oil. "If 90 percent of your GDP, 80 percent of your exports, 60 percent of your fiscal revenues is from one source, it's going to take you a decade or more to make significant transformation," he says. For decades, oil helped the Saudi royal family keep a compact with the population: Saudis would be taken care of — free health care and education through college, cheap utilities and gasoline, often a government job, and, until recently, no taxes. In return, they did not challenge the royal family's absolute rule. The crown prince now wants to change that deal, says Bernard Haykel, a Saudi Arabia specialist at Princeton University. "He's saying that you know we are no longer able to afford this nanny state ... and so the terms of the social contract have to be renegotiated," Haykel says. The crown prince is sweetening the deal with the population by loosening the ban on cinemas and concerts and allowing women to drive and go to work. Now you see Saudi women working in malls and at hotel receptions — unheard of until a few months ago. The crown prince is also pushing some megaprojects, including spending $500 billion to build a futuristic city called NEOM. To help pay for such projects, the government is planning to sell a 5 percent stake in Saudi Aramco, the giant oil company. It is being touted as one of the world's biggest initial public offerings. Mohammed al-Tuwaijri, the minister of economy and planning, says that sale will provide a huge injection of cash to the kingdom. "Aramco is a first-class, world-class company, great proven track record," he says. "It's going to be a very attractive proposition for local and global investors." The crown prince is also involved in drumming up foreign investment. He was on weeks-long tours to the U.S., the U.K. and France promoting Saudi Arabia as a good place to do business. In November, he rounded up about 200 of Saudi Arabia's wealthiest people — including government ministers, businessmen and senior members of the royal family — and detained them in the Ritz-Carlton hotel in Riyadh, in what he said was an anti-corruption cleanup. Most were held for three months, until they agreed to pay large settlements totaling more than $100 billion, according to the Saudi attorney general. There were cries that it was an unlawful crackdown on possible rivals and that it could scare off investors. But Saudi economist Motasher Almurshed says the move was hugely popular with ordinary Saudis. "This move is done for the benefit of the Saudi population, for the Saudi economy, and for making the vision possible," he says.